If you've just joined the group, please introduce yourself here. Howdy my name is Phil/ TD 654 and I just registered and applied for deployment. Hey all. My name is Luke, BH2622. And I joined a few weeks ago. Still absorbing a bunch of info. here. Can't wait to finish my TD. Thanks for havin' me! Hey there! Rob Rak (TK-158) from the Connecticut Garrison. I built a backpack and have a black pauldron. I also have one ammo pouch for my left shoulder, but I just sent out a check for some Norwegian ammo pouches. Been a clean TK for over three years, but looking to go dirty. Before I take the plunge on modifying my FX armor, I was hoping to look at pricing on the TE2 stuff. Trooped with some of you guys at the Spike TV Video Game Awards (which was a blast!). Charlie Mann from the Old Line Garrison here (unofficial Imperial Photographer). You may have seen my work with TD-1536's Sandy Point beach photos. I've been doing my Sponge Bob impersonation absorbing everything I can on the boards Currently a TIE pilot, and eventually working up a TD suit of armor. Thanks for hosting the dirtiest board in the Empire! once dirty there´s no point back... and anyway.. how will want it!!! Will O'Lynnger in FL here. I just did the registration and requesting of deployment thing. Any ETA guesstimates on a reply? Location:Washington, D.C. moving to NYC soon! Hiya everyone, Tony here from the UK, some may know me from the RPB, RPF and UKG. I see a lot of people I know posting on here. So I thought I would join up, I'm currently making a Sandtrooper at the moment, well really been making one for the last couple of years, slow project, great to see more stuff available these days. I've been lurking here as a guest for a while, I want to get my TD up and running soon. With thanks to all you fine folks and your informative threads and posts, I now have a pretty good idea of what's required. Yo aim new in here, but old in the game. Born in Denmark 1973, and life down town copenhagen. I work as a professional social care taker whit young people. Ive been a BIG fan of star wars since 1980 ESB, and since that day i dream off being a storm trooper ex. In 2001 i got my GT armor and join 501st. Sold my GT armor in 2004, and get my two AP autenticprops stunt anh armors. I love the storm troopers, but the sand trooper has all ways been my favourite number one. So iam looking forward to join MEPD asap. 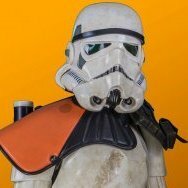 I lust love the forum on sandtrooper.net, the social and split trooper knowless ex. In my garrison, nordicgarrison (finland,norway,sweden,denmark) we are about 40 members. And about 15 are danish, so the forum its a great place for me to have a bigger talk about what we all love... Sandtroopes. Have a nice day, hope to troop whit some off ya some day. Move a long... Move a long. Klik... Klik. Thanks my friend, and its has been a great welcome on sandtrooper.net for me. I only got kind replys ex, a lot off good troops are in here i think. We crazy danes have been talking about, crashing UK more in the future to troop whit ya. You know its under 1 hour in flying, and only around 100 dollars for a ticket ex. Hello, another newbie joins the pack! Always been a trooper nut, but don't have a sandy yet... (yet). Hopefully I'll fix that before too long though. Well lots of reading here to catch up on so see ya later! I'd like to shout out a big welcome to all the new troopers here! It's great seeing the huge influx of new faces, so I just wanted to say how excited I am to have you all here. Hi, My name is Keith and i'm from the UK. My armour is clean, but i have made a replica "move along" helmet in the past. Some of you may know me for the stormtrooper mic tips i make. I also took a lot of photos of the original sandtrooper helmets when they were at Christies in London. I met memeber gonk27 (Jeremy) when i was at Christies and he took a lot of photos too which some of you may have seen. Hi I'm Chris, again from the UK. Don't have any armour yet but hope to soon. I have so much reading up to do yet. Welcome my fellow UK potential dirty trooper. Remember if you need any dirty help PM/email me or visit my web site. Welcom to the finest Sandtrooper detachment in the world, im a UK sandtrooper too with Marcus and between us im sure we can get you sorted out. Hi. I'm Allen from Richmond, Va. My pics are on here a couple of times, but I just now registered. Better late than never. Very glad to be among fellow sandies. What's up, Allen? Glad you are here, again. Welcome brother.